Living a Fit and Full Life: Give Your Skin All it Needs with LANEIGE! Committed to helping you achieve younger, radiant skin through Advanced Water Science Technology. A hydrating, refining, richly foaming formula that de-flakes rough skin via fruit acids. Formulated with birch water and vitamin E acetate, the rich, creamy lather this cleanser generates lifts impurities, leaving skin refreshed, refined and hydrated. Gentle fruit acids, derived from five different plant extracts, then step in to de-flake dead surface skin and smooth out rough patches. A moisturizing and brightening toner that helps promotes a even-looking complexion. Light and refreshing, this formula combines patented Mela-Vita crusher™ brightening technology, improving the appearance of dark spots and uneven skin tone, while Phyto Sugar Water replenishes skin’s moisture. Featuring Pore Minisizing™ technology, it glides smoothly onto skin, clearing impurities and reducing the appearance of pores. With a fast-acting formula, the mask quickly dries to absorb excess oil - say goodbye to shine. A limited edition, Lavender-scented version of the cult-favorite water sleeping mask that delivers intense hydration, while you sleep. Did you know skin recharges while you sleep? Become an overnight sensation with this infamous sleeping mask. Hydro Ionized Mineral Water™ floods skin with moisture, Hunza Apricot and Evening Primrose Extract help brighten and purify, all while enjoying LANEIGE's exclusive Sleepscent™. Give your skin all it needs with LANEIGE! LANEIGE is a brand I've been hearing amazing things about for quite awhile now but have never actually tried anything from them up until now. I had the pleasure of trying the products above and I have to say, I'm greatly impressed. LANEIGE's Moisturizing Foam Cleanser is an amazing cleanser! It's a hydrating, refining, richly foaming formula that de-flakes rough skin via fruit acids to give you smooth healthy skin. This cleanser works like a dream to remove every trace of dirt, makeup and excess oil all without stripping your skin. It leaves skin clean and de-flakes dead surface skin to help smooth out rough patches leaving skin smoother than ever! Bright Dew Skin Toner from LANEIGE is a wonderful toner! It's a moisturizing and brightening toner that helps promotes a even-looking complexion. It also helps to improve the appearance of dark spots and uneven skin tone to give you an even complexion to love! 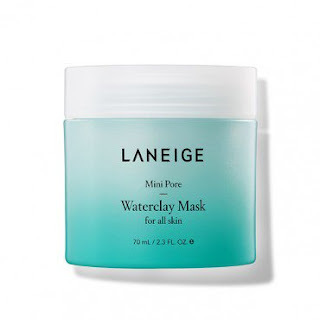 Mini Pore Waterclay Mask from LANEIGE is an awesome mask! It's a clarifying gel-clay mask that is crafted from mineral mud and mint water. It removes pore-clogging oil and impurities with each use to give you radiant skin! 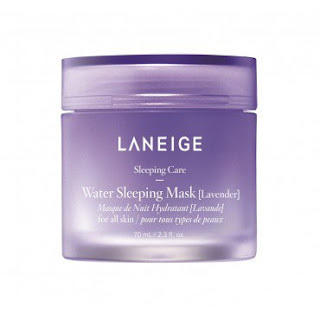 LANEIGE's Lavender Water Sleeping Mask is my new favorite mask for dry skin! It's a limited edition, Lavender-scented version of the cult-favorite water sleeping mask that delivers intense hydration, while you sleep. As someone who suffers from dry skin, I can tell you this mask works wonders to restore moisture overnight. It's my new BFF! 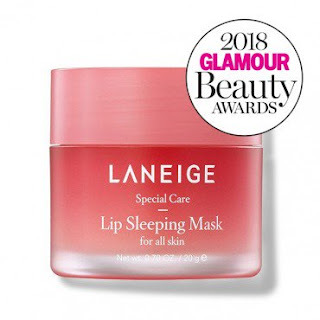 LANEIGE's Lip Sleeping Mask is also a favorite of mine! When you have dry skin, you tend to have dry lips so this Lip Sleeping Mask has been a life saver for my lips. It's a leave-on lip mask that soothes and moisturizes for smoother, more supple lips with each use. It smells heavenly and will leave your lips kiss-ably soft by morning! LANEIGE has just what your skin needs to look its best! Click HERE to learn more about LANEIGE! 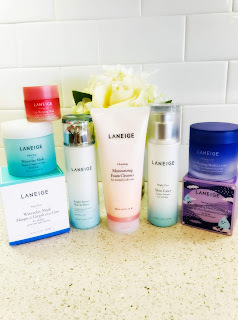 Follow LANEIGE on social media!